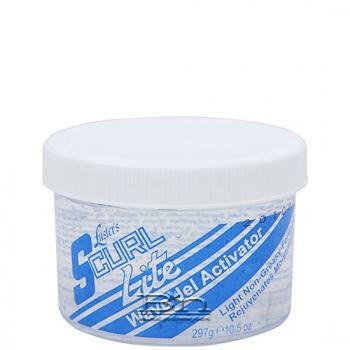 S-Curl Lite Wave Jel Activator is a light jel that will activate your curls and waves without a trace of grease. S-Curl Lite Wave Jel actually eliminates the "shrinkage factor" that results from shampooing your curly perm. So now your curls and waves will be healthy looking, soft, and never frizzy or sticky. Directions: For best results, first apply a moderate amount of Lite Wave Jel into hands, rub together then thoroughly massage into hair and scalp. Second, moisture with Luster's Oil Moisturizer. Style as desired. Caution: For external use only: Avoid eye contact and keep hair away from open flames. If product gets into eyes, rinse thoroughly with water. Keep out of reach of children.